A compelling update that improves workflow, adds new synthesis, plus other welcome additions. User interface changes foster improved workflow, especially for casual users. New Sine Bank and Modal. Bank modules open up new synthesis and processing vistas. Lazerbass, plus other library additions, increase an already bountiful collection of well-crafted synths, sequencers, samplers, and effects. Only a 'dot-update' after a five year wait. Still no 64-bit support. Fresh graphics and usability improvements are just a couple of great new features. Using Reaktor previously often resulted in a very cluttered screen. The new UI puts needed features at hand in a tidy single window. Reaktor is Native Instruments' metaphorical Lucy, the genetic ancestor of their products. It debuted in 1996 as the pioneering software synthesizer Generator. Nine years of improvements (and name changes) later it became Reaktor 5. Then progress stopped. 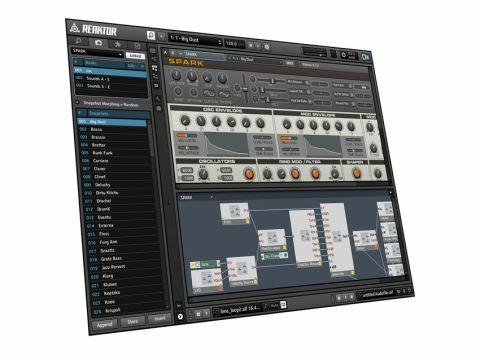 Anxiety seeped in to the user community: five years is a long time between substantive updates, so when NI announced Reaktor 5.5, it fostered both excitement and trepidation: something new, but why just a 'dot' update? "The fact NI chose to infuse a free update with so much shows excellent commitment to its users." However, Reaktor 5.5 is much more than a maintenance release. It combines usability improvements, fresh graphics, new synthesis options, and valuable additional content. If the Reaktor 5.5 update has a theme its 'workflow improvements'. These grab you the first time you launch the Reaktor application after a painless installation. Gone is multiple window clutter, replaced by a sleek, attractive single window user interface (UI). Plug-ins users are in for a treat: its UI is finally consistent with the standalone version. Multiple panes are revealed or hidden as needed. Focused on tweaking or performance? Show only the ensemble panel. Need to find something? Unhide the left-side tabbed panel that contains the Browser, Snapshot Management, Panelsets and Inspector. Time to do some rewiring under the bonnet? Switch to Structure View, or as needed, display both the panel and a structure in a split view. Special structure 'bookmarks' make it dead easy to jet around within a complex multilevel patch. The refreshed UI imparts Reaktor with a more modern, up-to-date feel. A single window approach is a boon to laptop and single display users. Users with multiple displays may be less enthused: you cannot separate panes into separate windows. Some serious workflow improvements accrue from reworked instrument and ensemble file loading functions. Prior to Reaktor 5.5 this was an impediment to causal use. Reaktor 5.5 now helpfully creates a full ensemble when you 'import' an instrument, and finally offers an easy way to incorporate an existing ensemble within another. For many users, Reaktor's biggest selling point is its bundled and community libraries. So what is new on the shelves? In a word: Lazerbass. Load Lazerbass and you are first struck by its ultramodern, 'I demand to be run on a touchscreen' UI. Select a few snapshots, press some keys, and it's readily apparent that Lazerbass is not just an old-school modelling bass synth. Lazerbass is a showcase for Sine Module, Reaktor's new additive synthesis subsystem. All sound generation and processing, even filtering and effects, are accomplished through this one module. It is an additive tour de force! If Reaktor 5.5 was a West End show Lazerbass would appear prominently on the marquee. Also included are two previous 'for purchase' libraries, Electronic Instruments 1 and 2. This treasure trove offers synthesizers, effects, grooveboxes, sequencers, and, a couple 'hard to categorise' items. Previous users will be very familiar with what it has to offer. Reaktor 5.5 introduces two powerful synthesis modules, Sine Bank, and Modal Bank. Sine Bank specialises in 'additive synthesis', a technique that has proved to be a hard beast to tame. Sine Bank may be the whip you need. Modal Bank is the gateway to a magic land of organic and lively sounds created using the 'resonant modes' of physical objects like blown pipes and struck metal bars. It will be interesting to see what the builder community does with this one. Reaktor 5.5 lacks a true headline addition (the impressive Lazerbass is close) but the real story is how Reaktor has improved as a whole. The UI changes materially enhance workflow, especially for casual users. Reaktor has always offered excellent value and the additions to Reaktor 5.5 only make it more so for new customers. The fact that NI chose to infuse a free update with so much shows excellent commitment to its users. Yet, five years is a long time and existing customers are perhaps a bit underwhelmed - oft-requested improvements, like 64-bit support, are nowhere found. But, Reaktor 5.5 signals NI's continued committed to the platform and begins a hopefully grand chapter in the Reaktor story. Note that, as well as being available on its own directly from NI, it's also included in the Komplete 7 bundle, which costs £399.